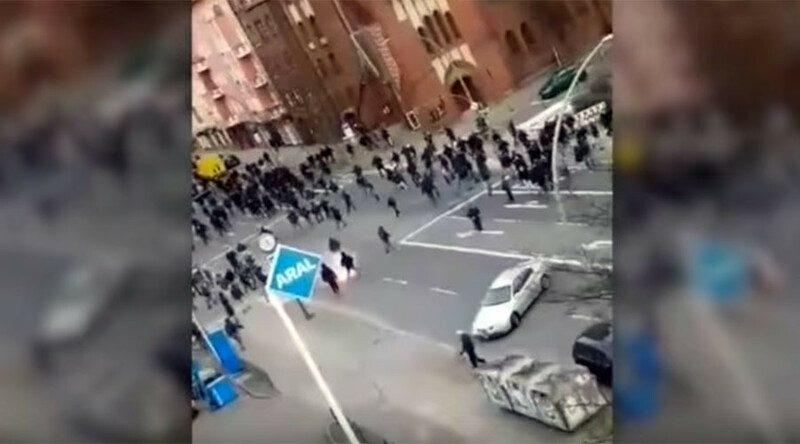 A huge brawl erupted on the streets of Berlin near the Moabit district on Saturday ahead of the football match between fierce rivals Hertha BSC and Eintracht Frankfurt. At roughly 1pm local time a crowd of approximately 60 people engaged in the violence, a police spokesperson told rbb 24. Some media reports citing witnesses suggested that up to 200 people took part in the fighting. — Nacht Floh (@BZ_NachtFloh) 25 февраля 2017 г. Projectiles including beer bottles, stools and flares were thrown by several ultras during the fray. — AndreasGandzior (@AndreasGandzior) 25 февраля 2017 г. Emergency services were quick to respond and dispersed the crowd quickly, making up to 40 arrests in the process, according to Bild. — Philipp Europa (@kaamehaamehaa) 25 февраля 2017 г. Five people were treated by paramedics at the scene for injuries sustained during the skirmish, according to Der Tagesspiegel. — Peter Rossberg (@PRossberg) 25 февраля 2017 г. The rivalry is notoriously violent and security was already tight ahead of the evening game with increased police presence at the Berlin Olympiastadion. Alcohol-free beer is served at the event as a precaution to further limit the potential for violence at the derby. — Iwobi's Dancing Feet (@InvertdWhinger) 25 февраля 2017 г.